Financial Regulation Matters: Donald Trump Hints at a Return to ‘Glass-Steagall’: Praiseworthy Development, or Political Point Scoring? Donald Trump Hints at a Return to ‘Glass-Steagall’: Praiseworthy Development, or Political Point Scoring? Today’s post reacts to the news that US President, Donald Trump, has yesterday hinted at establishing a ‘Glass-Steagall’-type piece of banking legislation. The ‘Glass-Steagall’ Act, more formally known as four specific components of the U.S. Banking Act of 1933, was established to separate the commercial and investment arms of US banks as part of the ‘New Deal’ era that defined President Franklin D. Roosevelt’s first term in office. For this post, the focus will be on the actualities of President Trump’s intimation, based against the backdrop of his other actions, and then ultimately the focus will be upon the larger implications of choosing to follow this pathway, and indeed the implications of doing the opposite. Speaking to Bloomberg news, Trump declared on Monday that, with regards to reintroducing a Glass-Steagall-type Act, he was ‘looking at that right now’ and that ‘there’s some people that want to go back to the old system, right? So we’re going to look at that’. Before we look at the actuality of the situation now in 2017, it is worth contextualising this debate, and that contextualisation starts (arguably) in 1999 with the Gramm-Leach-Bliley Act, more formally known as the Financial Services Modernisation Act of 1999. 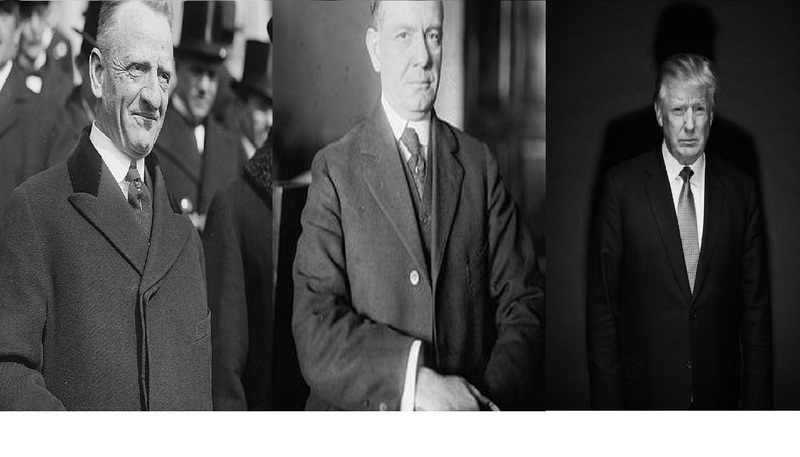 That Act, which was theoretically designed to increase the size of the financial sector, allowed for the merging of the commercial and investment arms once more because the so-called ‘Quiet Period’ – the years following on from the Great Depression that saw massive banking and financial failures like that of Charles E. Mitchell and National City Bank (now Citibank) – had induced an amnesia with which we are more than familiar with now. Signed into law by President Clinton, the Act allowed for the ‘ratcheting-up’ of the financial system and, arguably, facilitated the development of what we today call ‘too-big-to-fail’. However, there is much debate on this topic. Economics Nobel Prize winners Joseph Stiglitz and Paul Krugman have both criticised the decision to repeal Glass-Steagall and have attributed the Financial Crisis to it (Stiglitz more than Krugman). However, renowned legal academic Lawrence J. White suggested that, rather than the amalgamation of the two arms, it was the underwriting and trading in securities that were the cause, not the actual ability to merge the two arms. Furthermore, academics like Charles Calomiris have been steadfast in their support of the amalgamation, stating that (having campaigned for Gramm-Leach-Bliley) ‘those of us who argued in the 1980s [for the repeal] can now say that we told you so. Bank of America, JP Morgan Chase, and Citibank have all weathered the financial storm’ because of their ability to diversify both geographically and in the products that they can offer. The debate is indeed split, but those that argue for the amalgamation miss one crucial issue, and that is the systemic effect of this ‘ratcheting-up’ – as this author notes in a forthcoming book, those three exceptionally large financial institutions received, collectively, $115 billion in taxpayer money via the Troubled Asset Relief Programme; so, how well did they weather the storm in reality? This underlying debate was witnessed today in Trump’s tone. However, rather than representing an actionable plan, best-selling business author Larry McDonald said in a BBC interview that, in reality, the chances of the reintroduction happening are slim at best. His reasoning runs along two lines: firstly, Trump has much more pressing concerns to deal with, particularly in reference to his tax reform, as was previously discussed here in Financial Regulation Matters; secondly, the intimation buys Trump political capital without the prospect of having to fulfil the pledge – McDonald says ‘the average little guy loves to hear this, so he’s going to score points with his base and it may not hurt him politically at all because it may not get done’. The reason why it will not come to fruition is simple; the mightily resourceful banking lobbies will make it their business to fight any sort of Glass-Steagall-type Act coming into force, as demonstrated by the American Bankers Association’s declaration that ‘there is broad agreement, including among all our banking regulatory agencies, that Glass-Steagall would not have prevented the crisis or the housing market collapse’. So, with all this in mind, it is arguably clear that Trump is ‘playing the field’ so-to-speak; the pandering to the electorate that feels the brunt of banking transgressions, and the realisation of the reality of the situation i.e. banking lobbies would quell such a move quickly, leaves us with perhaps two understandings – the influence of banks is very unlikely to be reduced, and Trump’s intimations are not worth very much at all. However, the issue does raise an important point that is central to the discussion of the effects of Glass-Steagall, and that is the issue of focus. If one focuses upon the numbers and what they can see in front of them – what I will call eyesight for the purposes of this post – then Glass-Steagall’s reintroduction would not help. The crisis was a result of poor underwriting practices, fraud within the mortgage market, and poor regulation in managing the bubble; none of this would be rectified by a separation of commercial and investment banking arms. However, if we look further and wider afield – what I will call ‘mindsight’ – then Glass-Steagall is absolutely crucial. It is crucial, in this sense, because the amalgamation of the two arms allowed for the industry – an industry that has consistently demonstrated that when there is an opportunity to make extraordinary profit, albeit at costs that affect society for generations, then they will do so – to grow to unprecedented levels. The growth, when combined with the engrained ethos in the sector can only ever result in one outcome – the same destruction that was witnessed in 1933 and 2007/8. What is required, now more than ever in this divisive political arena, is ‘mindsight’ – we must take actions based on more than what we can see. We must take actions based upon the positive potential of a world that aims for sustainable and ethical prosperity. Watch President Trump’s actions closely and from within those philosophical parameters – it is clear to see which end the political elite operate within.